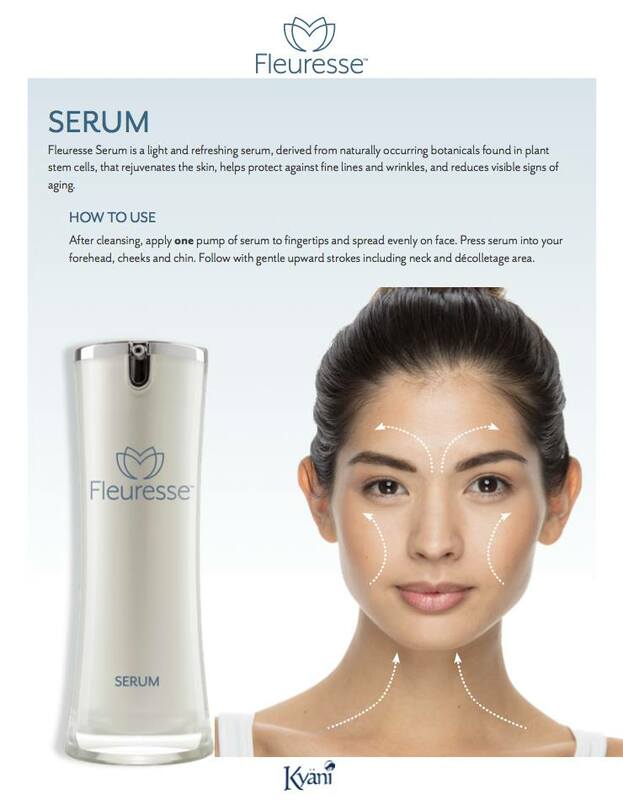 Here is an easy reference in using Fleuresse Serum, a refreshing light serum that comes from completely natural botanicals which derive from plan stem cells, rejuvenating the skin, helping protect against “old age wrinkles” and lines that build up in the skin over time. After cleansing, pump once to get a dab of serum and apply smoothly to face – forehead, cheeks and chin. Proceed with small strokes from a bottom-to-top upwards motion, including the neck and any other areas you’d like to focus on. We personally perform this several times a day for best results (especially in the first couple months trying this product), but you can experiment with however many repetitions work for you… we also recommend to drink plenty water throughout the day to stay hydrated, as this can affect your skin over time. See more info on our Kyani Fleuresse Serum page here. Also watch this video from our own first-time user of Kyani Fleuresse, Jackie Thomas, number 1 viewed “Kyani Fleuresse” video on youtube (click here to watch)!